Hello everyone and Happy March! It’s the first and that means a new challenge here at a2z scrapbooking. This month it’s all about coloring! Markers, pencils, paints, whatever you fancy, just color it in. We can’t wait to see everyone’s creations. The design team has some inspiration for you. Click the designers name to head over to their blog for the full details on their project. Categories: Coloring, Handmade Cards, Watercolor | Tags: Cindy, dragonflies, Karen, Kristina, Peonies | Permalink. Hello everyone and HAPPY NEW YEAR! We hope that 2019 is everything you hope it to be. It’s time for a new challenge here at a2z scrapbooking. If you’re anything like me you’re still frazzled after all the Holiday fun, so lets keep in simple with a good old Anything Goes challenge!! Our design team has some fun inspiration for you, just click through to the team mates name to learn more, and remember to review the challenge rules, posted at the bottom of this post. Looking forward to seeing your creations! Kristina used a wedding set from Sugartree Stamps to create this New Years card! great for many occasions, including the New Year! Categories: Challenges, Handmade Cards | Tags: Cindy, Gwendolyn, January 2019, Kristina | Permalink. Hello everyone and welcome to the final monthly challenge for 2018! We want to see your winter related projects! Snow us your snowflakes and shinny stuff, your holiday cards and winter scrapbook pages, anything your heart desires as long as it first the winter theme! Remember to stay tuned for the winner announcement from last months challenge, you’ll find that here on the blog on the 7th. The design team has some winter inspiration for you, if you want to know more about any one project, just click through on the designers name or photo to be directed to their blog for all the details. Kristina used the wintery Snowflake Edge Fancy Die from Hero Arts to create a snowflake border on this holiday card set! Psst.. This die is on sale in the store!! 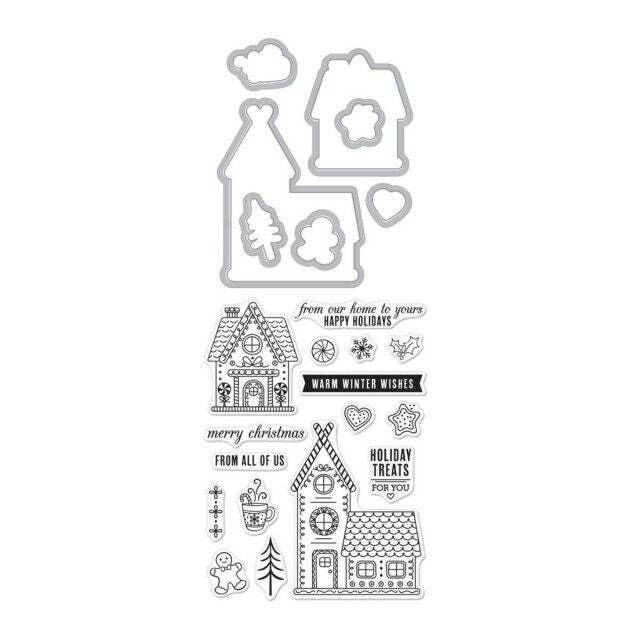 Arlene use the Hero Arts Gingerbread Stamp n Cut set for the images on her card to create a little winter holiday scene! Cindy use the Hero Arts Greenery Edge Die to create this gorgeous focal point for her sentiment! 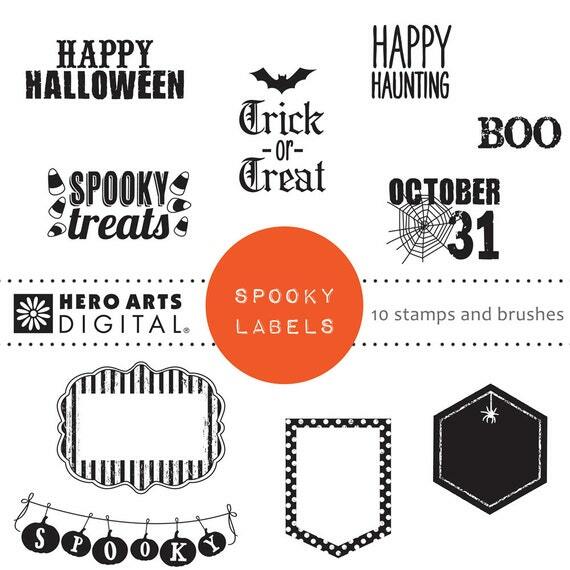 This months prize is the Holiday Tags digital kit from Hero Arts, in addition, if you used Hero Arts or Sugartree Stamps, you will receive a $20 gift card to our store!! The a2z scrapbooking store carries a wide variety of Hero Arts products! Get discounted new releases, sales, grab bags & more. Proceeds from our store benefit Celiac & Behcets disease foundations. Use my discount code a2z15 to get 15% off your purchase of $25 or more. If you’re looking for a Hero Arts product you don’t see in store, use the Request Custom Order button from with-in the shop. Categories: Challenges, Handmade Cards | Tags: Arlene, Cindy, december challenge, Gwendolyn, Kristina, Winter Wonderland | Permalink. Hi, friends, it’s time for our monthly digi duel when two team members use the same digital stamp set and see what they can come up with. Our digi set this month is Hero Arts Summer Travel Words and our duelists are Cindy and Arlene. Let’s see how they do! Here’s Arlene’s take using the Summer Travel Words. I love how she repeated the stamps to get a fun, graphic look to this card. This would be a great postcard to send back home too if you’re lucky enough to get to play in the sunshine. And here is Cindy’s take with the same stamp set. Instead of a card, Cindy has put together a scrapbook page that’s all ready for the photo! Love this idea, since there are a million vacation photos on my phone right now…wish I had worked ahead a bit! Thanks for stopping by to see the duel! The a2z scrapbooking store carries a wide variety of Hero Arts products! Get discounted new releases, sales, grab bags & more. Proceeds from our store benefit Celiac & Behcets disease foundations. Use my discount code DLT15 to get 15% off your purchase of $25 or more. If you’re looking for a Hero Arts product you don’t see in store, use the Request Custom Order button from with-in the shop. Categories: Digital, Handmade Cards, Hero Arts, Scrapbook Layouts | Tags: Arlene, Cindy, digi duel, Digital, hero arts summer travel words | Permalink. Hi, friends, today we have two fab team members dueling it out with the Hero Arts Words of Love digi stamps. Each month on the 11th, two team members will take the same digital stamp set (which is the monthly prize for our challenge) and see who can turn the stamps into the best project. While there are no swords and no real winners, it’s always a blast to see how two different designers take the same stamp and make it their own. We get inspiration from both projects, so I guess we’re the winners! This month the digi is Words of Love and if you enter our challenge, you could be the randomly drawn winner of this February prize. If want this one sooner, you can hop over to the store and pick it up for just $6.49! You can use any manufacturer’s products to enter for this versatile digi, but if you use Hero Arts products and you’re randomly chosen, you’ll win BOTH the digi set AND a $20 gift code to the store. And now, En Garde! Here’s Arlene’s take with this perfect-for-February stamp set. And Cindy parries with this project using the same stamps. That was fun! Thanks to Arlene and Cindy for entertaining us and thank you for joining us for the February Digital Duel, it’s cool to see the projects side by side and it’s hardly dangerous at all! The a2z scrapbooking store carries a wide variety of Hero Arts products! Get discounted new releases, sales, grab bags & more. Proceeds from our store benefit Celiac & Behcets disease foundations. Use my discount code insert your code here to get 15% off your purchase of $25 or more. If you’re looking for a Hero Arts product you don’t see in store, use the Request Custom Order button from with-in the shop. Categories: Challenges, Coloring, Digital, Handmade Cards, Hero Arts, Valentine | Tags: Arlene, Challenge, Cindy, digi duel, digi stamps, Digital, hero arts words of love, words of love | Permalink. Hello everyone!! Happy December!! I love this time of year. Family and Friends celebrating together!! Are you ready for all of the gift giving? If not our new challenge, should help with that. Our new challenge this month is “Anything but a Card”! All you have to do is use any Hero Arts product on your project. Be creative with this challenge. Please be sure that your project contains at least ONE main HERO ART Product as the focal element! This challenge will be pretty interesting. The DT has creating some awesome projects to inspire you to play along with us. For the full photo tutorial on how to create this shaker tag, please head on over to my blog for that info. Amazing isn’t it!! I hope you love what you see and that it inspires you to join us this month. You have the entire month to create a new project and enter it into Mr. Linky below. By entering you will have a chance to win a $25 Gift Certificate to the a2z Scrapbooking Store. One lucky winner will be announced on the 7th of January!! Categories: Challenges | Tags: Anything but a card, birds, Challenge, Cindy, december challenge, Donna, Helen, kymona, Martha, shaker tag, Tags, Wreath | Permalink.